Luis Suárez has matched Argentina’s Hernán Crespo as the all-time leading goalscorer in South American World Cup qualifying after scoring Uruguay’s second against Colombia in Barranquilla on Tuesday night. 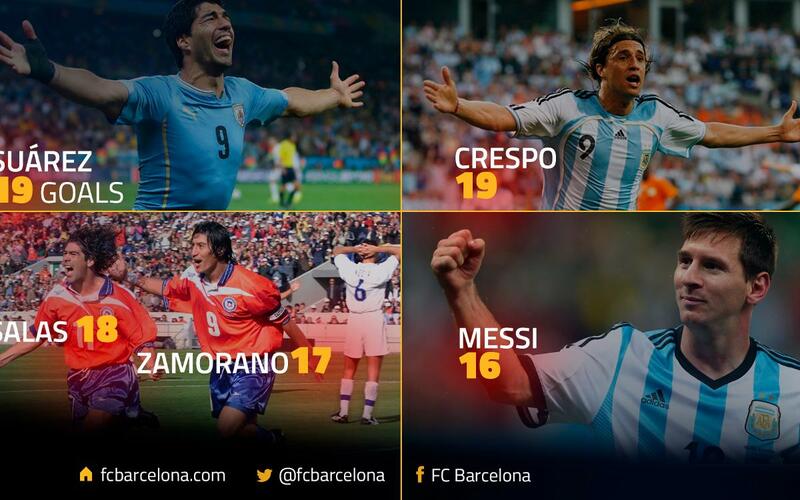 His goal moves him one and two goals respectively ahead of Chileans Marcelo Salas and Iván Zamorano. Lionel Messi is fifth in the tanking with his 18 goals for Argentina. Since making his international debut in 2007, Suárez has scored a total of 47 goals for his country and in World Cup qualifying has scored against all nine other sides in the Conmebol zone. Chile have been his biggest victim, with five goals (including four in the same match) and Uruguay have only lost once in a game, against Bolivia, when their star striker has found the net.. Otherwise, it was was a night of mixed emotions for the Uruguayans. They were knocked off top spot by Brazil, who without the suspended Neymar Jr won 2-0 in Venezuela. But a 2-2 draw in Colombia is by no means a poor result and the celeste are still very strongly poised to make the trip to Russia 2018. After the home side had taken the lead and Cristian Rodriguez had equalised, Luis Suárez’s historic goal came after 73 minutes. But the celebrations were soured eleven minutes later when Yerry Milna got the cafeteros back level. Later on in a lively tenth round of matches, Argentina followed their disappointing 2-2 draw in Peru with an even more worrying setback in their bid to qualify for the finals when they lost 1-0 at home to Paraguay. With star player Leo Messi back in Barcelona with an injury, but Javier Mascherano playing all 90 minutes, it was a lacklustre performance from Edgardo Bauza’s side in Córdoba. They went behind after 18 minutes when Derlis González made the most of some sloppy Argentinian defending and were unable to find a response, not even from the penalty spot when Kun Agúero’s chance to finally level up went begging. The result leaves Argentina fifth in the Conmebol qualifying standings, which as things stands would be insufficient to qualify direct for the finals and would mean an intercontinental playoff instead. Earlier in the day, Marc-Andre ter Stegen was an unused substitute for Germany as the world champions maintained their 100 per cent record in European Group C with a 2-0 win defeat of Northern Ireland.